Palmer is an old property with a long history. It was classified in 1855 as a "third growth," but today it's wines are routinely as costly as most of the top second growths. Located in Margaux (the hamlet of Issan, technically), the estate comprises something like 45 hectares. Some 55% is planted with Cabernet Sauvignon, 40% Merlot and 5% Petit Verdot. I have found their wines to be far more interesting with a bit of bottle aging. Young wines tend to show nicely, but often lack the excitement of others as the wines tend to be made with an eye towards aging. 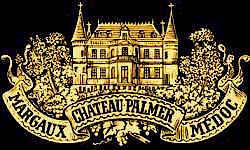 However, given a decade or so in the bottle, Palmer really blossoms nicely, showing the almost floral (roses and violets) notes typical of the wines of Margaux. 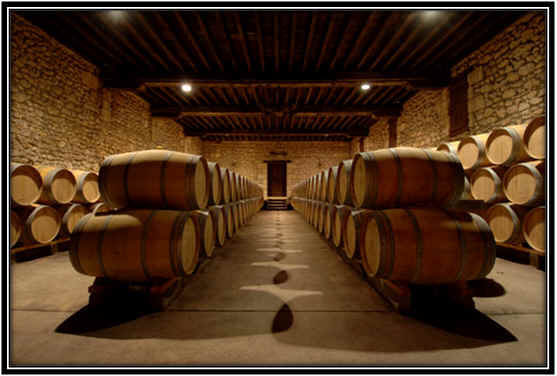 Their wines don't have the oak you'll find in those of Chateau Margaux, for example. Palmer seems to be a tad tighter in its youth and lacking the sweet oak back-drop, the wine simply needs time to be enjoyable. We recently found some more 2004. It's 46% Cabernet Sauvignon, 47% Merlot and 7% Petit Verdot. This is showing very handsomely, bright with a touch of that floral note we find so often in Palmer's wines. It is particularly good paired with mildly-seasoned lamb, veal or a prime rib roast. A young wine, still, of course, but delicious with substantially savory foods. 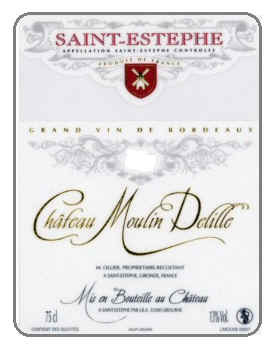 The wines of Saint-Est�phe used to be regarded as fairly sturdy, hard-edged Bordeaux. These days you wouldn't think the wines of this northern outpost in the Medoc were that imposing. Back 50 years ago, or so, it was generally accepted that Bordeaux wines demanded a decade or two of bottle aging to be drinkable. Winemakers didn't worry about high levels of tannin as that simple went with the territory and the territory was "Cabernet Sauvignon." Well, these days winemakers understand few people invest in wines with the idea of buying something today to enjoy ten years down the road. It's an "instant gratification" world, so wines made these days are often vinified with the idea that you're looking for something to put on the dinner table tonight, not wait a decade. One way to produce a more supple and ready-to-drink wine is by increasing the proportion of Merlot and that's what happens with the Moulin Delille wine from the Ollier family. The 2011 has a high percentage of Merlot, whereas in the days of yore, Saint-Est�phe wines were largely Cabernet. This is a nice, medium-bodied Bordeaux...and while you can hold it for a few years, this is not likely to blossom to a great point of complexity...it's nice now and it's rather ready to drink. There's a nice dark berry fruit note here with a touch of cassis. Having been matured for a year, or so, in small French oak, there's a mildly cedary note on the nose which adds interest to the wine. Its small price tag makes this an attractive alternative to many high-priced or mass-produced California wines. There are three L�oville estates and this is, hands down, the best of the three. Not that the other two are slackers, it's simply that this property makes a wine that rivals the first growths for "best of vintage" honors. The vineyard is located at the northern end of the appellation of Saint-Julien and it neighbors the famed Ch�teau Latour. The vineyard is "guarded" by a number of stone lions (there's one keeping a watchful eye on the grapes atop the stone arch depicted on the label). You'll read stats which say the vineyards of L�oville-Las-Cases is 65% Cabernet Sauvignon, 19% Merlot, 13% Cabernet Franc and 3% Petit Verdot. The standards are extremely high and the wine is labeled "Grand Vin de L�oville" for a reason. The best wine goes into the primary label, while those lots that don't make the "cut" had been sold as "Clos du Marquis." Even this wine can be exceptional. I recall a candle-lit dinner party where we turned on the lights to better examine the color of the 1961 we were drinking. The wine, at well more than 20 years of age, was still incredibly dark and youthful! We've been Clos du Marquis fans ever since and buy a bottle of each new vintage for "research" purposes. In fact, the 2009 vintage of Clos du Marquis is rather good. These days they claim their "Petit Lion" wine is their "second" wine and the Clos du Marquis, we're told, comes from vineyards west of the chateau and bordering vineyards of some famous neighbors, including L�oville Poyferr�, L�oville Barton and Pichon Lalande. The Clos du Marquis 2009 is a rather 'serious' bottle of Bordeaux. It's fairly big and displays the ripe qualities of the warm vintage. It's said to be 70% Cabernet Sauvignon this vintage, with 20% Merlot and the remaining 10% split between Cabernet Franc and Petit Verdot. The wine seems to show a nice, cedary undertone from some wood, but it's balanced and certainly quite drinkable now. Some experts suggest it can be cellared for another 20+ years, but we view it as nice now and probably at its best over the next decade. And while a hundred bucks isn't "cheap," the wine is of a quality many of the hundred and two-hundred dollar + bottles from Napa would be delighted to have. L�oville's Grand Vin is matured in a high percentage of new oak, but they try to balance it by not going the 100% new wood regime employed by some of the neighbors. In richer vintages they'll increase the percentage of new wood. In more modest vintages, less new wood is used. 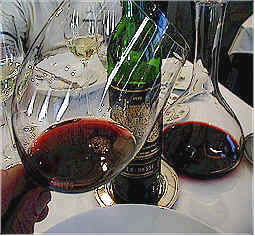 The wine routinely shows the "black fruit" character of Cabernet. We usually find a lovely bit of cedary oak, too. Prices for current vintages are extremely high and so I often look for older favorites, finding them reasonably priced by comparison. 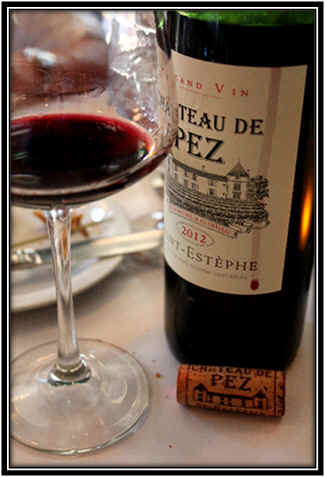 Ch�teau de Pez used to be a fairly simple, standard quality red Bordeaux. Some years ago, 1995, the estate came into the hands of the Roederer Champagne company and, my-oh-my, how things changed! They began instituting changes and upgrades in the vineyard and in the cellar. We are delighted to report the quality of the wine has elevated nicely and despite having been designated or classified as a Cru Bourgeois (back in 1932, well before the increased dedication to quality), these days their wine rivals many 3rd, 4th and 5th "growth" estates. The property consists of 30 hectares, with 26 of them planted. They have primarily Merlot and Cabernet Sauvignon, with a smattering of Cabernet Franc, Petit Verdot and Malbec. The wines are fermented in wooden vats and then transferred to small oak cooperage. Some 40% of the barrels are brand new, 40% once-used and 20% twice used. We've really enjoyed the wines over the past decade. The prices are generally reasonable given the quality of the wines, though we by-passed the more highly-rated vintages (2009 and 2010) as we felt the wines did not warrant the elevated prices. We find, it seems, the critics prefer hotter vintages and riper fruit which diminishes (we believe) the elements of terroir in the wines. We like cooler vintages or less ripe wines, otherwise Bordeaux tastes like Napa Valley which tastes like Chile or Australia. In any case, the 2012 Ch�teau de Pez rolled into the distributor's warehouse, so we bought a bottle, as you can see in the photo at the start of this posting. We were delighted by the wine. The dark fruit of the Cabernet and Merlot are prominent, but beautifully framed by a nicely woodsy character. The tannin level is sufficient to give the wine a bit of cellaring potential, but not so high that you can't enjoy it tonight. The Thunevin name is not popular amongst "old guard" Bordeaux vintners. Here's a fellow who was an "outsider," a wine lover who worked in a totally non-related field who started the entire "garagiste" movement. Jean-Luc Thunevin made his famous (or infamous, if you prefer) Ch�teau de Valandraud wine for the first time in 1991. The early vintages received great critical acclaim from America's wine "god," Robert Parker. Thunevin had made wine of greater concentration and intensity than his neighbors, thanks to his hands-on approach and his insistence upon striving for perfection. So this "new kid on the block" was making wine superior to those who'd been in the business for decades, causing him to be the object of much scorn in the St. Emilion and Pomerol regions (and on the left bank, I imagine, too). Thunevin's ideas are simple: He believe in low yields, organic farming, extensive work in the vineyard work and wild yeast fermentations of absolutely ripe, mature fruit. Some have questioned his wines as being "too international" in style, claiming the "terroir" is lost. In fact, Valandraud in vintages at the end of the 1990s comes from vineyards which are not the same as those in the very first years! But Thunevin has been quoted as saying "You can't make a race horse out of a donkey." There has to be good quality to the terroir and vines from which a wine originates. We drove out to look at some of his vineyards and to have a peek into the winemaking facility for the purposes of industrial espionage. Thunevin is a proponent of fermenting in wood. These vats also, as you can see, have temperature controlling pipes inside. Thunevin believes in using lots of new oak. "Great wine is not afraid of new oak." says Thunevin. We tasted his young wine out of barrel---most impressive. Good luck in coming up with the cash to buy a bottle! Valandraud runs upwards of $200-$300 a bottle. Thunevin's "Clos Badon" St. Emilion is a much more affordable wine and it's styled along the same lines as the wine for millionaires. Clos Badon is a mature vineyard in St. Emilion comprised of about 6.5 hectares. It's located near Pavie and Larcis-Ducasse being planted with 70% Merlot and 30% Cabernet Franc. Like Valandraud, it is matured entirely in new barrels. The 1999 vintage we have in the shop is only the second vintage Thunevin has made this wine. While I found the Valandraud wine to be very nice, I must confess I have had trouble in finding it to be worthy of such a high price. Apparently there are those souls with wallets and palates which find some value in Valandraud. I find the Clos Badon to have the polish and Thunevin styling that I enjoy and, it's priced within the realm of a place I call "reason." The label, at a distance, reminds me of that of Napa's Harlan Estate. It turns out Harlan is much admired by Thunevin. I guess we shouldn't be surprised that Jean-Luc would admire another new winery which can charge stratospheric prices for the privilege of owning a bottle. The wine named after Thunevin's daughter, Virginie, fared very well in a blind-tasting of 2001s at the shop. The wine displays a lovely plummy Merlot fruit and sweet, cedary oak. It's delicious right now and may age nicely for a few years. We don't view it as a long-term wine, however.